For what it’s worth, Windows Mobile 6.5 is shaping up to be quite a modern-looking mobile operating system, even if its new looks are only skin deep. In one of the latest builds to have leaked (among the many that has), build 21202 for those of you playing at home, are the much talked about bundled designer themes, including but not limited to the pink and white Gingham by Isaac Misrahi. It is now revealed some of the other designers are Ron Arad, Vera Wang, Rock and Republic and Diane von Fürstenberg. Simply said, they look great. Without a further ado, the themes. Screenshots courtesy of Patrick from OSNN.net. Whilst the wallpaper is essentially the most visible element of the theme, a good wallpaper can be all the difference between a great looking interface and a stunning interface, especially if the UI exposes it as much as it does here with all of its alpha-blending goodness. And I’m sure Microsoft is not going to go easy on the number or variety of themes available in the final release. My current favorite is the default one. Nice, Still not going to buy it though. I like all except for “Red”, “Blue” and “Purple”. “Purple” is nice but what I don’t like about is that is has too much pink and purple. This is definitely an improvement over the screenshots from earlier builds. I still feel like Microsoft was very conservative with this release. This was the time to go all the way…to really reinvent how Windows Mobile fits into a world filled with iPhones. 6.5 barely keeps up with what others have been doing to make 6.1 work (TouchFLO for example). I’m hopeful that 7 will really turn heads. @Clifton: In my opinion, I think this new “Today screen” is very intuitive compared to most other mobile’s “main screen” solutions. Coupled with the even better WM6.5 “lock screen” I think WM6.5 is more innovative than people give it credit for. Of course, the experience is not equal across the OS, and quickly deteriorates to WinCE-standards among some low-level apps and system settings. I really like the Classic Blue. I still hope that the HTC Touch HD will be able to upgrade. Nice themes. Default theme is the first one, right? Correct me if i am wrong, but according to these screenshots, the only changes are the wallpapers. The Bars are mostly transparent, they are just displaying the wallpaper, but in a slight translucent view. On what basis are these called themes? Will the icons be different or what? @Long: It’s definitely a step in the right direction, I’ll give you that! @Clifton – Yes they should have done far more with 6.5… but thats what 7.0 is meant to be all about. Unfortunately, current alpha pics of WM7.0 look very disappointing. @Michael – the XDA link Long refers to is for the Touch HD (aka Blackstone, from memory) so although it’ll probably not be officially released, the wizards at XDA will continue to make it available – and it will run faster than the core Microsoft / HTC release! There are a lot of nice little touches to the UI but they should have used either CHome or Titanium “right across” the UI in my view. Nice, I like orange and blue. Purple is cool because it’s so different from the usual black, blue and white mobile UI’s. Hmmm, no internet bar or icon on the home screen. One would think going online would be a key component of Windows Mobile devices. Hmmm.. having a skin deep change to the primary screen that is so-so modern looking is NOT innovative! For someone that have used WinMobile since the Windows CE days up until recently switching over to an iPhone – it’s about UI consistency and a “it just works” that really works. After years of unexplainable lockups, networking inconsistencies and just plain clunky UI – if Windows Mobile 7 isn’t a completely radical overhaul, then with the Palm Pre raring to go – MS should just forget about smartphones. I started using Windows-powered handhelds with Windows CE 3.0 PocketPC Edition (Casio Cassiopeia E-125), and I have continued using them through Windows Mobile 2003, 5.0, 6.0, and now 6.1. And I’m no longer impressed. Microsoft has really dropped the ball here. The web browser is based off of Internet Explorer 4.0. The operating system is still using Windows CE 5.2. Getting an AKU from your vendor is nearly impossible. Why can’t Microsoft provide these updates? They’re late to the game with an application store. Microsoft was never a big player in this industry. Palm reigned supreme in the early days. Once phone functionality was added, RIM’s Blackberry won the day. Now with Internet browsing being a huge factor, Apple’s iPhone is the new king. When will Microsoft learn from its mistakes and either step up their game or drop out of the race? Same situation for me. I totally agree with your comment. My opinion is that Microsoft recently realized the importance of this segment and how neglecting they have been with a very (at the time) innovating platform. Windows Mobile, from the consumer standpoint, is laughable when compared with the competition (mostly Apple and Palm). Windows Mobile 6.5 seems to be driven by a small team with limited artistic resources and innovative skills. You just have to look at the horrible scroll bars, the IE zoom bar and the basic controls to understand that the much required UX refactoring won’t happen with 6.5. Meanwhile, there is probably some hope. I really think that the real work force is already at work on a complete Windows Mobile revamping that version 7 will be. And I expect Silverlight to be a key player in this refactoring at the UX level. Time will tell. If this is not the case, then they should clearly forget the mobile platform. They are already late and without a major splash very soon, it is “game over”. Apple and Palm won’t stop anytime soon. And since Mobile 6.5 is not going to splash very hard, that leaves only version 7. Pingback: Sneak peek at Windows Mobile 6.5 themes - istartedsomething - .:YourNetwork:. 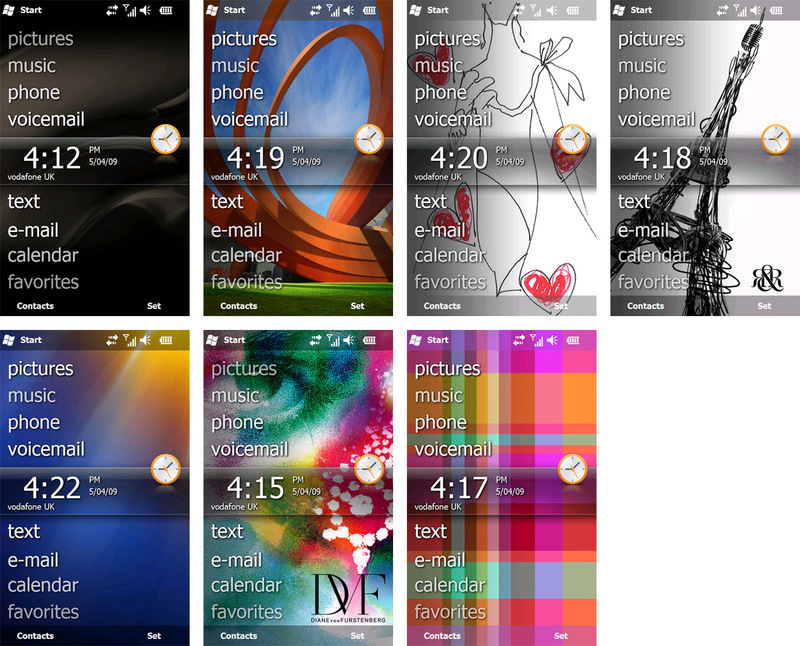 Pingback: Windows Mobile 6.5’s designer themes unveiled! I have to admit I do not see what is so great about these themes. It’s just different wallpapers and minimal other changes (a differend colourded glass bar – big whoop?). 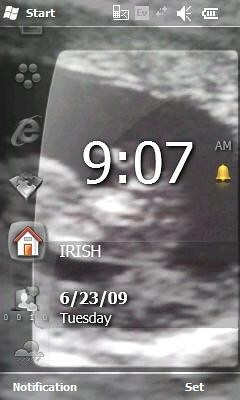 Even the Symbian themes (!) are way more sophisticated. You might argue that the wallpapers look nice – they do, but, seeing as there are hundreds of -better- wallpapers used in other (non-microsoft) mobile ‘themes’ (real themes, actually, not just changed wallpapers), I do not share the exaggerated excitement expressed above (I like the alliteration). Here’s a link to an entertaining video on Windows Mobile created by Microsoft. http://www.microsoft.com/video/en/us/details/2e08e6c5-73b2-403f-a9b1-f41fce6a08bd. Enjoy! Pingback: Windows Mobile 6.5 themes leaked | PPCmine-Freeware for Pocket PC,Windows Mobile Pocket PC downloads. Any chance of someone uploading the wallpapers?